Not only did Donald Trump win the U.S. presidential election two weeks ago (something I predicted in advance would happen), but markets exhibited wild swings. Investors got whiplash based on secret middle-of-the night trades by two of the richest men in the world. Carefully constructed election trading strategies ran into a pair of billion-dollar buzz saws, wielded by legendary stock trader Carl Icahn and hedge fund maven Stan Druckenmiller. Their combined predawn raid on the markets produced shocking results. When the dust settled, the stock market was in an expected place by an unexpected path, and gold was in an unexpected place. The good news is that with these shocks behind us, we have much greater clarity on the path ahead. In fact, the opportunities for profit, especially in precious metals, are the best since late 2015. A review of the price dynamics of the past two weeks will explain why. The trading strategy I recommended for my readers was to buy a put option on the S&P 500 with a quick exit and a call option on gold. Most of this played out exactly as I expected. Trump did win the election. Stocks did sink and then bounce back. Gold did surge. But there were two trading shocks that frustrated the expected profit opportunity. As Donald Trump celebrated his surprise election win over Hillary Clinton and equity futures swooned in response, billionaire investor and Trump supporter Carl Icahn headed home to start trading. Icahn, 80, left President-elect Trump’s victory party in the early hours of the morning to bet about $1 billion on U.S. equities, he said Wednesday in a telephone interview on Bloomberg TV. S&P 500 futures fell as much as 5% overnight, triggering trading curbs that prevent further declines. Contracts on the benchmark index all but erased that decline by the time markets opened at 9:30 a.m. in New York, and the benchmark index rose as much as 1.4% Wednesday. I expected stocks to sell off at first and then rally back once investors had time to consider Trump’s low-tax, big-spending, light-regulation policies. Normally, it would have taken a day or two for large institutions to digest the policies and pivot to a stock market rally. That would have been enough time to exit the initial put option position I recommended. 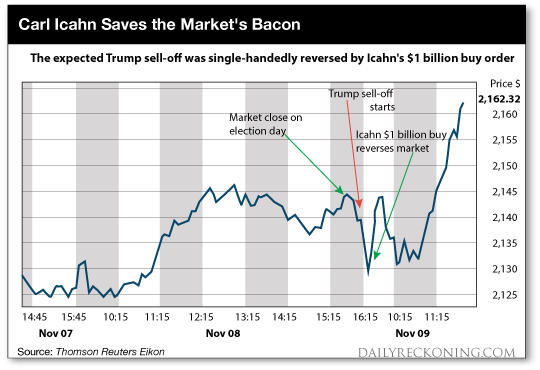 But Icahn is not an institution — he’s a maverick individual, a Trump insider and one of the few traders in the world with enough fire power to single-handedly reverse market momentum. Icahn compressed the reversal into a matter of hours, not days, and did so in the middle of the night before other investors could profit. Something equally extraordinary happened in the gold market at about exactly the same time. Gold prices surged late on Nov. 8 and into the early morning hours of Nov. 9 as a Trump victory became clear. This was exactly in line with my expectations. Based on sentiment and momentum, gold should have held those gains. We don’t know the exact size of Druckenmiller’s gold sales, but given his total fund size, outspoken support for gold and potential leverage, an estimate of a $1 billion gold dump is not unreasonable. This was the second “billion-dollar buzz saw” that cut up the recommendations I made for my readers. I expected a stock reversal, but I did not expect a gold reversal. I expected gold to hold onto its post-Trump gains. The “Druckenmiller Dump” put an end to the rally. The decline in gold continued into the following day, Nov. 10. That action was based on a change in sentiment and “me too” sales by weak hands who were piggybacking on Druckenmiller all along. That’s what happened two weeks ago. Where do we go from here? Where are the new opportunities to profit now that the election week shocks are behind us? For now, the best advice in the stock market is “Don’t fight the tape.” Markets have a view that bank stocks will go up because of a steepening yield curve, construction and transportation stocks will go up because of higher infrastructure spending, pharmaceutical stocks will go up because of reduced regulation and defense stocks will go up because of increased defense spending. Gold is more interesting. I can’t read Stan Druckenmiller’s mind, but his stated reasons for dumping gold don’t make sense. In fact, he may just be a trader who had a good run, made substantial profits over the past year (perhaps $200 million) and decided to take his money off the table. That’s fine, as it’s his money. But when Druckenmiller says, “The reasons I have owned [gold] for the last couple of years… may be ending,” that’s demonstrably incorrect. The reasons to own gold are insurance against extreme risk, as a hedge against inflation, and as a sound form of money in a world where central banks are losing control. All of those reasons still apply. In fact, the reasons for owning gold are more urgent than before Trump’s victory. Trump’s big spending plans will blow a hole in the budget deficit. If the Fed accommodates the deficit with “helicopter money,” inflation will surge. If the Fed leans against the big deficits with rate hikes, this will cause a stronger dollar and lead to a global liquidity crisis in emerging markets. If bank regulation is eased, banks can be relied upon to leverage up with risky derivatives, which will make the next financial crisis more, not less, likely. 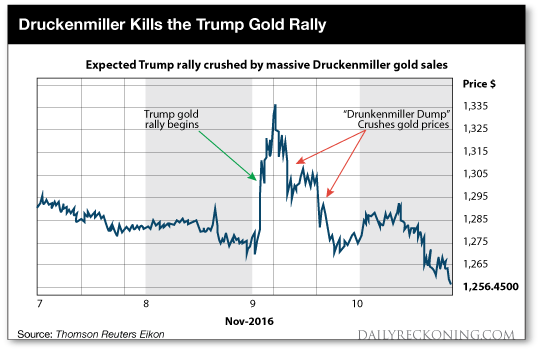 Druckenmiller’s stated reasons for selling gold are equivalent to saying, “I cancelled my fire insurance because now that Trump is president, we won’t have any more fires.” Don’t count on it. Trump himself was the first presidential candidate since Ronald Reagan to speak favorably about the role of gold in the monetary system. That does not mean there’s an imminent return to the gold standard, but it does mean we can expect to hear more discussion about the monetary uses of gold in the months ahead. Whenever gold is considered as money, the necessity for much higher gold prices to support the existing paper money supply quickly becomes apparent. Druckenmiller has given gold investors a gift. By single-handedly taking down the gold markets, he has given investors an excellent entry point for new positions in precious metals. The gold and silver stories are still intact, with or without Druckenmiller’s participation. Who knows, he may even tiptoe back into the market — that’s what hedge fund guys do. Going forward, I expect to see gains in precious metals that will more than offset any losses from those two “billion-dollar buzz saws” that were out on election night.